So today, I packed my gear and headed to a nearby coffee shop to create something. In a few lines later (I had to wait for one hour after I exceeded 150 rate limit on Twitter), I had put together a simple script that helped me reduce the pain of searching for potential bloggers(who are authors). I assumed that Twitter users who mentioned the word ‘authors’ were likely to be authors themselves or review books through their blogs. Secondly, I made a partial assumption that most twitter users who talk about authors had their ‘website’ part of their profiles filled. So, I could easily get their blog addresses. If they didn’t have anything listed, I just moved on. #Let us get our first part out of the way here. #I find this more convenient than using a screen name. #I then add that value to the user_ids list for later use. In the second part of this post, I want us to look at the second function definition that will complete our script. Yeah, it is really short! #Within the same file, we will continue our script! #Call the function and store the links in a list. #That is all we need to get everything from the list!! And ….. here is what I got when I executed that code! 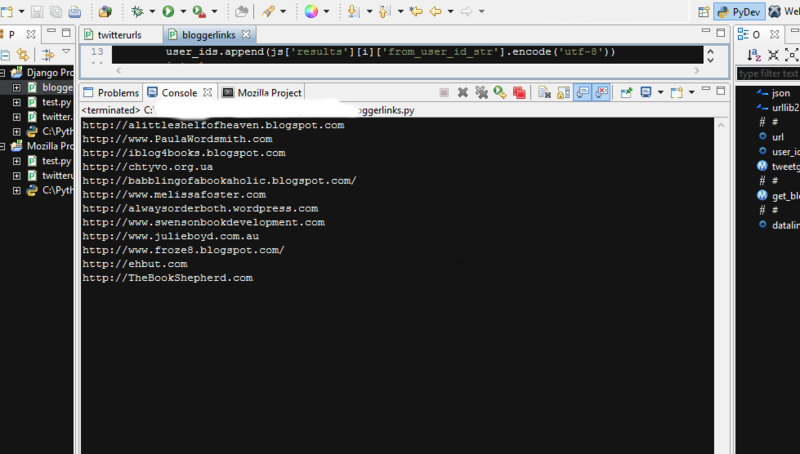 As you can see, you get easy to read urls that you can open using your browser of choice! One thing you might notice is that not all of the links are either wordpress or blogspot. You can go ahead and improve the script to grab only those links that have either wordpress or blogspot in them. You can view the image clearly by clicking on it! So why is this a better idea than searching on Google for individual bloggers? Simple; you get a ton of links that you can scan through using your browser, sending requests to their owners and saving yourself some time! As far as time is concerned, this script makes several API calls during the execution and you will notice a slight delay in completion. Also, you might hit the required rate limit (150) without knowing because you are making several requests per execution. That being said, I still had fun doing this and I have sent numerous requests for blog hops within a short time! I make an API call to Twitter servers to search for the word ‘authors’. Then saved the user_ids of the people who mentioned that word. We then use their user_ids to make another API call to their timelines. While doing that, we grab their url (the property that is part of the Twitter profile). If the url is missing, we ignore, otherwise, we store it in a new list. We finally iterate through the list and print the links out in a clean manner then visit them individually! That is it! I hope you had fun reading through this post. Got questions? Ask them! Thank you. That was an excellent post today. You have a great writing style. I would love to do more tutorials; the issue right now is time because I only have a few hours during the weekends to write! I will do my best either way to get some posted.